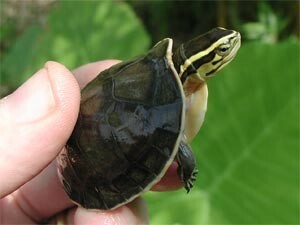 FreshMarine.com - Asian Box Turtles - Cuora amboinensis - Buy Asian Turtles Now and Save! Asian Box Turtles, also known as CuoraAmboinensis, are turtles belonging to the genus Cuora in the family of Geoemydidae which comprises of 10-11 species and same number of sub-species. This species is found from Assam to Southeast Asia and Southern China to Japan. At times they are also called �ambos� because of their carapace color which is usually black or dark brown. Even the skin and limbs are black. Yellow streaking on their neck and face gives them an unusual but beautiful appearance. These turtles have a capability of enclosing themselves in their shell as soon as they sense danger. They shield themselves from any danger by raising the front and rear sections which meets carapace. Asian Box Turtle possess a hinge on their plastron which is usually concave in the case of males while female�s plastron is flat. Another difference male and female Asian Turtle is that males have a longer and thicker tail whereas females� tail are shorter. Asian turtles grow up to 6 inches and can survive for more than 100 years. Often box turtles prefer staying on land but Asian Turtles are semi-aquatic. They reach sexual maturity mostly at the age of four or five, before that it is difficult to distinguish between males and females. Their head is small and its color may vary from olive to dark brown. A protruding snout and slightly hooked jaw is also a part of their characteristics. They are highly active in nature and spend most of their time on streams or pond. As these turtles are semi-aquatic, they inhabit near water bodies which are shallow and are dense with vegetation. Foe their artificial habitat, use a 20 gallon long tank or a large plastic tub. Create a setup of half land and half water. Provide enough water so that Asian turtles can submerge easily but do not provide a very deep setup as they are not excellent swimmers and may drown. 6 to 7 inches for adults would be sufficient. The half land area or the ��resting area� can be made of rocks. These rocks can be placed in steps which will enable the turtles to lead out of the water to the dry area. Basking rocks should also be provided sine soaking heat and light is also one of their favorite activities. Hiding spots are also essential. The temperature of their enclosure should vary between 75 and 80 degrees Fahrenheit. UV lights are also required to provide the turtles with Vitamin D3 which is required to absorb calcium and strengthen bones and shell. Water used for swimming and drinking should be chlorine free. Bottled natural spring water will be best. Asian Box Turtles are not picky eaters. They eat anything and everything. For keeping tem healthy include shredded carrots, kale, romaine lettuce, beans, corns and fruits like strawberries, blackberries and plums in their diet. Gut loaded crickets, mealworms, super worms and chopped cooked chicken. Meat can also be fed but only in small quantities. Most important is clean and fresh water.